Based on an exhaustive review of the scholarship, as well as the input of numerous academics at learning institutions around the country, this volume in the acclaimed New Directions for Institutional Research series provides faculty members and assessment teams with the tools they need to assess general education student learning outcomes While Part 1 provides a broad overview of the subject, Part 2 delves into the six key general education learning outcomes, namely, critical thinking, quantitative reasoning, intercultural competence, teamwork, civic knowledge and engagement, and integrative and applied learning. Editor′s Notes (Jeremy D. Penn). PART ONE: Background and Theory. 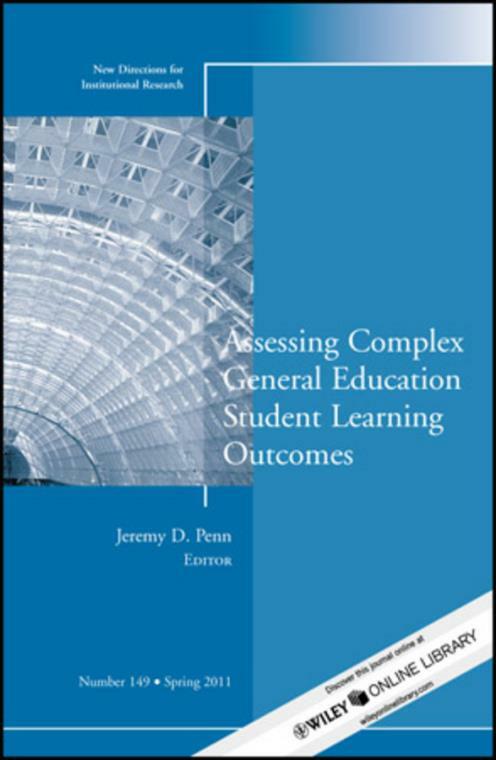 This chapter builds an argument for assessing complex general education student learning outcomes by briefl y examining the history of general education assessment, responding to common critiques of general education assessment, and establishing general education assessment as a critical responsibility of faculty members that can transform institutions while meeting expectations for accountability. A systematic process for assessing complex general education student learning outcomes is provided, linking assessment practice to a rigorous research approach that begins with theory (T), is aligned with activities (A) and strategies, uses indicators (I) and criteria, and includes multiple measures (M). This chapter examines the experience of using three standardized critical thinking tests over an eighteen–year period with a freshman critical thinking and writing sequence at Baker University. Findings suggest faculty should choose a defensible defi nition of critical thinking, carefully select a test that best represents that defi nition, and share and use results to improve student learning. Quantitative reasoning is multifaceted and should be assessed in a context–based, multifaceted manner. Recent efforts to assess quantitative reasoning, both with rubrics and multiple choice tests, are described. The authors present a definition for teamwork based on current research. A number of approaches for assessing teamwork, including written tests, quantitative questionnaires, and rubrics, are described. Implications for creating assignments and developing students′ teamwork skills are explained. Assessing intercultural competence is a complex endeavor. A literature review summarizes varying defi nitions of the term, and a model is presented. Promising practices for developing and assessing intercultural competence are described. Although most institutions are committed to developing civic knowledge and engagement, defi ning and assessing it is challenging. Recent efforts to develop a clear defi nition of civic learning and engagement are presented. Research on civic knowledge, civic skills, and civic identity and guidance on developing assessment strategies and program development are provided. Integrative and applied learning is defined and explored from a variety of perspectives. Examples for including this learning outcome in the curriculum and assessing it are shared. The chapter closes with guidance on faculty development for teaching integrative and applied learning. The impact of changes to faculty members′ roles and to students′ expectations for higher education, and the increasing demand for accountability on general education assessment, are explored. An agenda for future research on general education assessment is proposed.